The most inspiring moment of last night's US Open match between Venus and Serena Williams arguably wasn't during any of the intense volleys, or the brutal break points, or even Serena's match point ace. Perhaps the most inspiring moment came after the match was over, when Venus and Serena met at the net to hug, as is their tradition. The sisters have a long history of intense match-ups and fierce on-court competition, but they have just as long a history of being incredibly supportive and cheering each other on. The two are a beautiful example of women's sports at their best — competitive and yet mutually supportive. Venus and Serena have each been playing professional tennis for over two decades. They've played 27 official matches against one another, many of them in Grand Slam finals. And yet despite the fact that they have often been each other's fiercest competitors, they are also one another's biggest fans. When one is playing, the other is often found cheering from the sidelines. When they play each other, they never have anything but lovely things to say about the other. In years past, they've also teamed up to play doubles together — often in the same tournaments where they would compete in the singles matches. And then when the tournaments are over, they go home to the house they share in Florida. They are the definition of #squadgoals, and they show us all how, even in a world that loves to pit women against one another, two ladies can compete without letting it define their relationship. It is this dichotomy — being so intensely competitive while at the same time supporting each other so completely — that showcases just how amazing women's sports can be. Women's sports offer a space for women to be unabashedly competitive, to ignore a society that tells women to be meek or mild or accommodating. And women's sports are also a place where women can stand together and support one another even as they compete, to ignore a society that tells us that women are catty or petty or jealous or otherwise unable to get along. At its best — like, say, on a day Venus and Serena are playing — the world of women's athletics is able to be a space for both of these possibilities, and to showcase the message that despite all the social pressures to the contrary, both are possible. The Williams sisters show us that women can both compete against one another and support one another, both without reservation, at the same time. If you have ever watched Venus and Serena play one another, you know that they don't hold back. They push each other to be their best, neither going easy, neither backing down. And then, when the competition is over, they walk up to the net and they hug. So if you want to be further inspired, here are six times the Williams sisters have supported one another even as they compete. They show us what women's sports — and female competition as a whole — absolutely should be. Venus and Serena played their first professional match against one another in 1998 during the second round of the Australian Open while they were both just teenagers. And although someday their matches would be heralded events, at the time, it apparently wasn't considered all that impressive. Still, although they weren't yet the powerhouse players they would become, the girls were gracious and supportive right from the beginning. After the match, both embraced at the net and then stepped to the side to hold hands and bow together. In an interview off court, Serena talked about how it was sad that one of them would have to be eliminated in the second round. But, added Venus, "We made a pact that we're going to be number one and number two, so we only meet in the finals and then we won't care because it'll be for the title." So it seems they always knew this was their destiny. The sisters' first match at Wimbledon happened in the semi-finals in 2000. Venus emerged victorious after Serena served the match point, putting her second serve attempt into the net. Afterwards in interviews, Venus focused on how hard it was for the match to end that way, and how surprised she was since her sister normally has such an impressive serve. Meanwhile, on the doubles side, the two went on to win the tournament together. So obviously their head-to-head in the singles didn't get in the way of their team work. The first time the Williams sisters met in a final was at the US Open in 2001. Once again, Serena didn't play her best, and Venus won the match and the title. Afterwards, Venus told the press that both girls understood that when they were on the court, they were competitors, but that it was still hard to beat her baby sister. Serena meanwhile, told reporters that it was easier losing knowing that her sister won. This year, everyone has been talking about the "Serena Slam," aka the fact that Serena was the reigning champion at all four Grand Slams going into the US Open. It's the second time in her career she's had such an honor, the first time being in 2003 after defeating Venus in the final of the Australian Open. Although it was an intense game and an understandably difficult defeat for Venus, she was still happy for her sister. "I wish I could have been the winner, but of course you have a great champion in Serena and she has won all four Grand Slams, which is something I'd love to do one day," Venus said. "So, yeah, I'd kind of like to be just like her." Both Williams sisters had a difficult few years in the mid 2000s, struggling with injuries and illness, but by 2008, they were both in fine form when they met in the quarterfinals at the US Open. The match was an intense one, but eventually Serena edged out her sister in two sets, both of which required tie breakers. Afterwards, when asked if it was difficult to play her sister, Serena replied, "It is difficult, mostly because she's such a great player!" She added, "I try not to look at her because ... I want the best for her. I love her so much. She's my best friend." 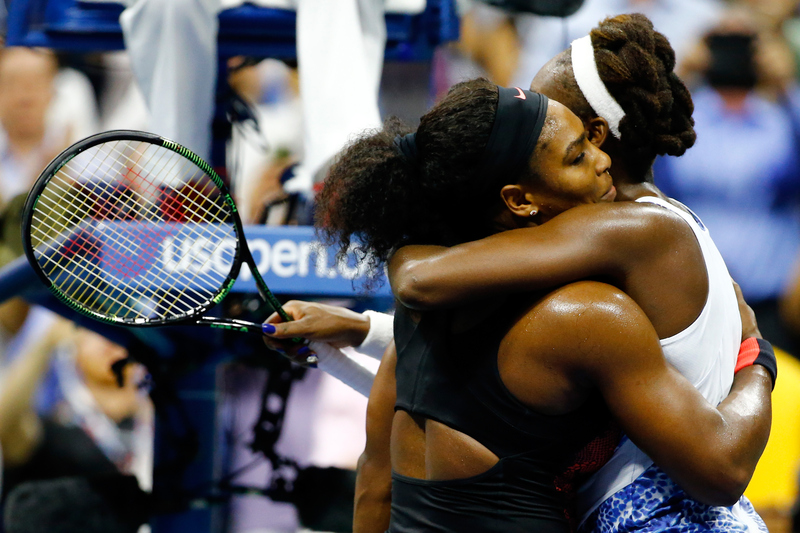 Seven years after that last slug-fest at the US Open quarterfinals, the Williams sisters did it again last night. By now, it seems, both athletes are more comfortable playing each other, even if it's still nerve-wracking for friends and family. But just as they were in the beginning, they are still quick to praise each other as soon as the serves stop flying.